William Morris is famous for having said . . .
Have nothing in your house [or garden!] that you do not know to be useful, or believe to be beautiful. I feel that he would heartily approve of this, as both beautiful and useful . 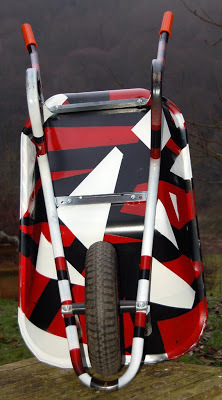 . . a customized wheelbarrow, given to us at this festive season by our son Dan. He has customized cars for himself over many years but this venture relates to the time when our ride-on mower was removed from here by local ruffians and the police discovered it on top of a local hill – on view, as it were, as a ‘lot’ in a somewhat bizarre rural auction. We got it back unharmed and Dan had the brilliant idea of painting it all over in strange and wonderful colours so that its ownership would never again be open to doubt and a thief would have as much difficulty in disposing of it as if he had nicked the Mona Lisa! So, we now have this fine work of art which will also do a fine (and secure) day’s labour in the garden. Lovely. Mondrian wwould have approved.